The Indianapolis Colts are coming off a terribe season. Chuck Pagano was rightfully fired after the season ended and it looked like they had their new man in place to take the job. According to multiple wrong reports, Josh McDaniels was in line to become the next Head Coach of the Indianapolis Colts. Unbeknownst to the person running the Colts official twitter account. As a Titans fan, this is awesome. It's February 7th and the Colts do not have a Head Coach. It's a total dumpster fire in Indy. 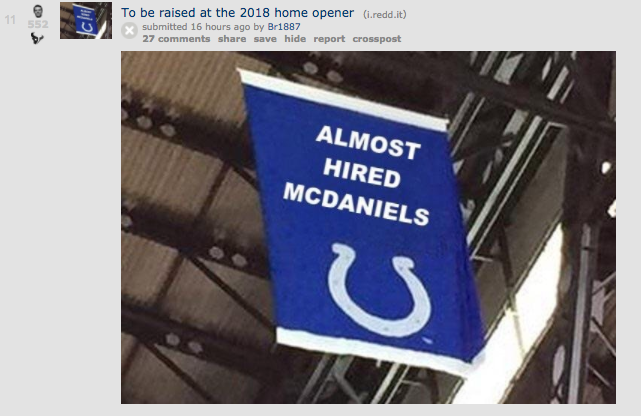 After the (now deleted) tweet was published, the Colts were forced to release a statement announcing that they had been turned down by McDaniels. INDIANAPOLIS — After agreeing to contract terms to become the Indianapolis Colts’ new head coach, New England Patriots assistant coach Josh McDaniels this evening informed us that he would not be joining our team. Although we are surprised and disappointed, we will resume our head coaching search immediately and find the right fit to lead our team and organization on and off the field. That is about as humiliating as it gets. The Patriots swooped in and re-declared war on the Colts with a cucking unlike any we have seen before. Just look at how pissed off Colts GM Chris Ballard was after having to address the media today. The rivalry is definitely "back on!" If you thought Belichick was going to sit around and mope all offseason then you are sorely mistaken. He's out for blood. Andrew Luck's health has been a mystery and he hasn't been seen in months. As for the coaching search, Chris Ballard is left with Mike Mularkey, Eric Mangini, and Terry Robiskie to pick from. Even though it's not really Josh McDaniel's fault, the Colts are a complete mess. Josh McDaniels agent, Bob LaMonte, dropped McDaniels as a client after he advised that he take the job in Indianapolis. LaMonte said he felt "blindsided" and dropped McDaniels as a client after he decided to return to the Patriots. Meanwhile, in Nashville, the Titans were introducing an all-star staff lead by Uncle Mike Vrabel, Matt LaFleur, and Dean Peas. What a time to be alive.